Mile High Run Club in NYC! 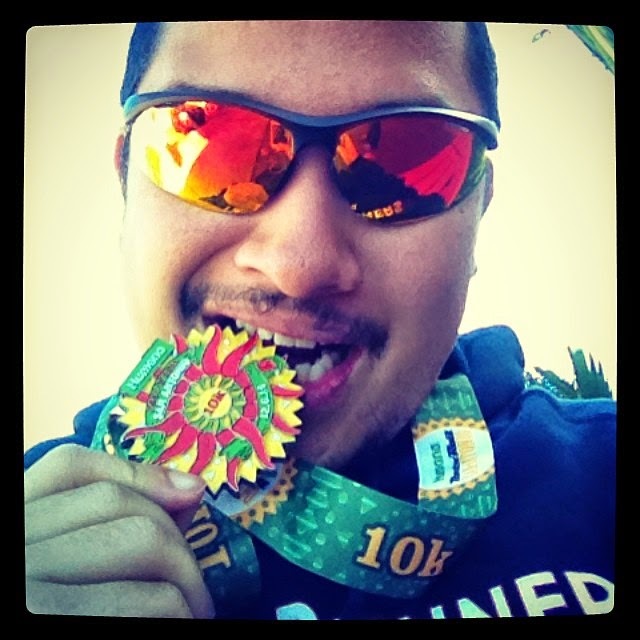 Crappy cold winter weather got you completely unmotivated to run? Well, look no further than Mile High Run Club, at 28 East 4th Street in NoHo. This new treadmill studio opened up only six weeks ago, boasting thirty top-of-the-line Woodway 4Front treadmills in a roomy space with a club-like atmospheree. It's a new concept that developed from the trend-setting explosion of SoulCycle spinning studios all over New York City. I was given a chance to try out a free class at this studio (courtesy of Elizabeth at Running and the City, one of my regular running blog reads -- thank you!! ), and jumped at a chance to break a sweat running... while not having to be outside. I approached the class a little hesitant; I was just coming off an awesome half in Florida the week before where I set a PR, and took this week off after feeling a pretty tight knot in my left calf that persisted over the last few days after the race - enough to make descending stairs somewhat bothersome (which isn't fun for someone who goes up and down stairs every single day on the subway). I hadn't run at all since the race, and my only real fitness in the past week was a day of lifting on Thursday at Mark Fisher; while my legs felt fine, I definitely could tell they weren't completely at 100% yet. The entrance on 4th Street is pretty unassuming - there's no signage up that indicates what's in this space. I met Sloane at the front desk, who checked me in and showed me around the simply laid out space: after passing the front desk and merch area, is a waiting area lined with a wall of small lockers, and on either side is the men's and women's locker rooms; behind a central door with a porthole window is the studio space. I came a bit early to check out founder Debora Warner's "Dash 28" 7pm class, a 45-minute all-levels class with a short warm-up, 28 minutes (duh...) of structured intervals, and 10 minutes of strength plus power training with kettle bells. Normally, this would be my style of class - but being that I do have all these distance runs I want to train for, I decided to sign up for the slightly more advanced class, called "The Distance." "The Distance" is an hour-long class with continuous intervals, tempo, hills, and speedwork on the treadmill. At the helm was Zack Schares, an accomplished triathlete and fitness trainer who also coaches cycling and swimming classes at locations throughout the city. Zack's great energy made me feel at ease as I approached the monster of a treadmill that I was going to hope to conquer over the next hour. The Woodway 4Front treadmill is a beast; measuring three feet wide by almost six feet long, and just a teensy bit taller than me! Each of these machines, that has a running surface with tank-like treads that mimics the feel of running on a trail (and therefore is much easier on the knees), retails for approximately $10,000, but the studio leases them. The space is covered in a spring-loaded (almost like a Marley floor, which is used in dance studios) with a black astro-turf covering. Because of an essentially double-sprung floor, it's super bouncy and the treadmills have a tendency to shake quite a bit. For someone who's not used to that sensation under their feet, it definitely took a little bit of getting used to. 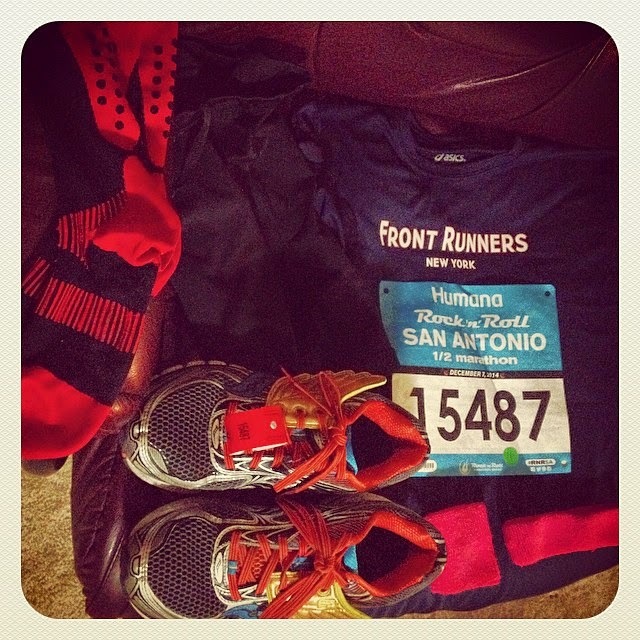 ...ready to get your #runnershigh? 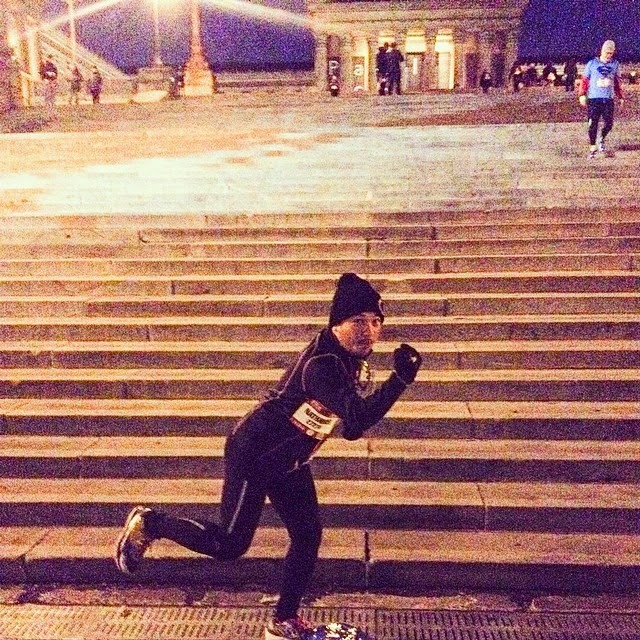 Zack outlined the basics of the class, which started out with an easy warm up run, followed by a series of timed intervals, some hillwork on various incline levels that he dictated, and then finally a few timed sprints. Runners can follow one of two categories of pacing: "joggers," for beginners and intermediates; and "racers," for advanced and elite runners. Each category has four levels with a speed range (in miles per hour) that the coach would yell out, along with an incline level. Thankfully, it is up to the runner to decide where within the range to run. A cheat sheet is located on the treadmill, with the categories, levels, and speed ranges. I expressed my fear of falling off the treadmill just before class, to which Zack responded it hadn't happened before, which somewhat allayed my initial trepidation. Then our class of roughly ten folks, at treadmills all throughout the room started. I probably went a little too fast off the bat, because ten minutes in I was huffing and puffing, and sweating buckets. If you're used to running outside and on asphalt or concrete, this is a completely different atmosphere. Being in an enclosed space, with a neutral room temperature and circulated air got to me at first, but I began to get used to it after a little while. And the fact that the treadmills shake like crazy can psyche you out a little as well (I was told that they were going to work on trying to secure them to the floor a bit more over the holiday break) The one thing I have to say is GO EASY when doing treadmill work for the first time. Because hill work is essentially first (going 5.0 to 7.0 on the incline, while being at a decent clip, roughly "level 2"), you don't want to burn yourself out too early, since the class is an hour long. I had to stop a couple times, because my calf began to cramp up, but hey, it comes with the territory with the change of atmosphere. Zack noticed me struggling and knew I was still in "recovery" from my big race, so he suggested I just use the minimum pace settings, which I gladly returned back to. I finally got the hang of it after we cranked up the speed and then lowered it back down again, adjusted it to how I was feeling, brought our incline levels up and down, and got into a good heart rate, from what I could tell. The screen on the treadmill gives you a rough pace that you're going, based off of the speed level you've selected, and then handicapped based on the incline level. I was still on the minimum end during the short recoveries between intervals, which I was thankful for since it was essentially speedwalking. We finished with a series of sprints: two minutes on and two minutes off. I decided to up the ante a bit since I was feeling a little more used to it and jumped up to 7.0 mph and then 7.5 mph (roughly 8:00-8:30 pace) and executed it great - and it helped that we had some awesome remixes that I used to establish a good cadence! (I even lipynched along to J. Lo's new single, "Booty," when it came on. I mean, DUH.) The great thing about this class is you can make it as hard or as easy as you want it, since you get to decide what pace you want to go on the machine. After the last sprint, we had a cooldown and then stretched out. That hour went by so quickly! I chatted with Zack real quick after and took a quick photo with him for the blog (and for their website!) - I definitely want to come back and try out the Dash 28 class! So, if you do feel unmotivated by the winter weather, you should definitely come into MHRC and try out one of their classes - it's also a great way to get any friends who are thinking about starting to run or wanting to train to get faster, and get them to try it out! I had a premonition that this weekend was going to go real well when I woke up Saturday morning at 6:55am, was out the door fifteen minutes later, and managed to walk six blocks to 74th and Roosevelt to a waiting Q70 bus, get to LaGuardia's Terminal D, and through the TSA pre-check line and to my gate in a record eighteen minutes. 7:28, I was sitting at my gate waiting to board my plane to Fort Myers, Florida. Little did I know that the number 18 would factor largely into this weekend's events. The flight down was super smooth. We landed at Southwest Florida International Airport (RSW) about twenty minutes early, and I met up with my new friend Maria, who was introduced to me through my running buddy Donna. Maria and I had never met in person before, but managed to work out sharing accommodations and transportation for the race in order to keep costs low. It turned out to be an awesome weekend with a new friend who I hope to run a lot of races with! We drove out of Fort Myers toward Cape Coral to the "expo" and packet pickup - it was really cute; tiny, but perfect for a race of this size. It was easy to get to and the volunteers working were super nice. We even got Advil Allergy and Sinus, a bag of Sweet Potato Chips, and a Redbull in our bags! We even got to preview the gorgeous medal (one that I have been coveting ever since finding about this race earlier this summer!) and see some of the other medals from the other races that Best Damn Race has. 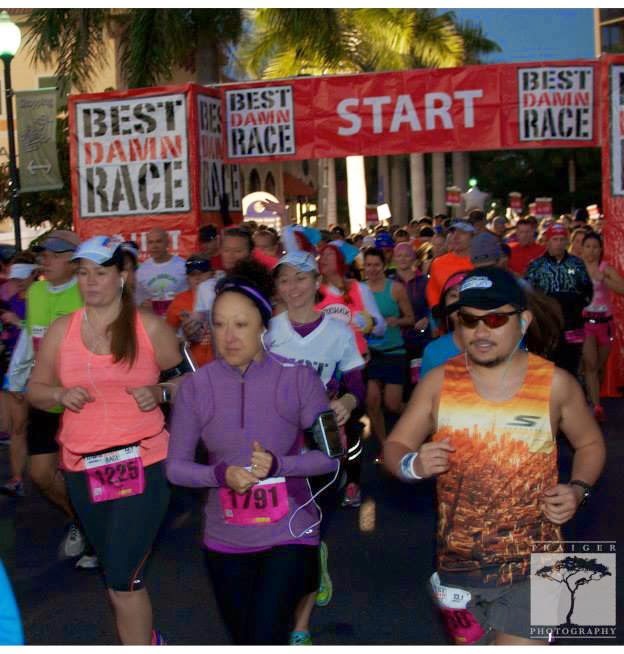 Now, the Best Damn Race series has been around for two years now, and will be running its third event in Safety Harbor, Florida (the first of the BDRs) in February 2015. This weekend's Cape Coral even would be the first in this location. Others offered are in Orlando (which will be running its 2nd event also in February) and Jacksonville (also new, running in January). 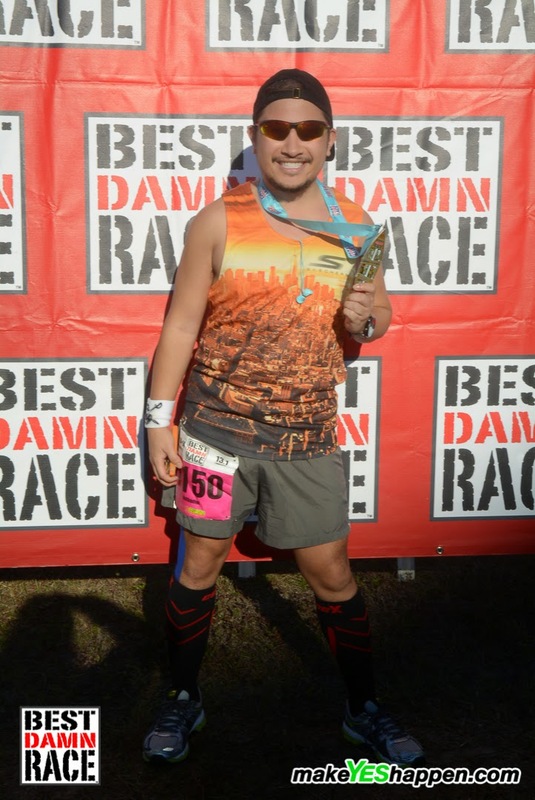 From their website: "Best Damn Race® is a running series created for runners by runners. 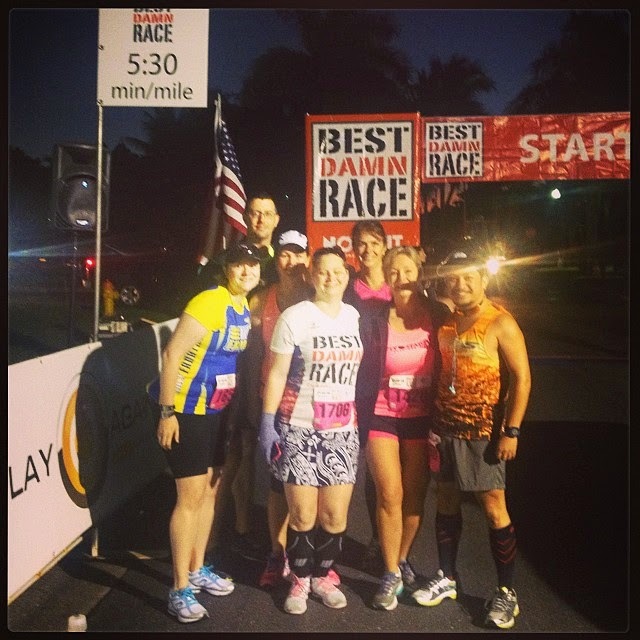 Our goal is to provide a big race experience at a local race price. 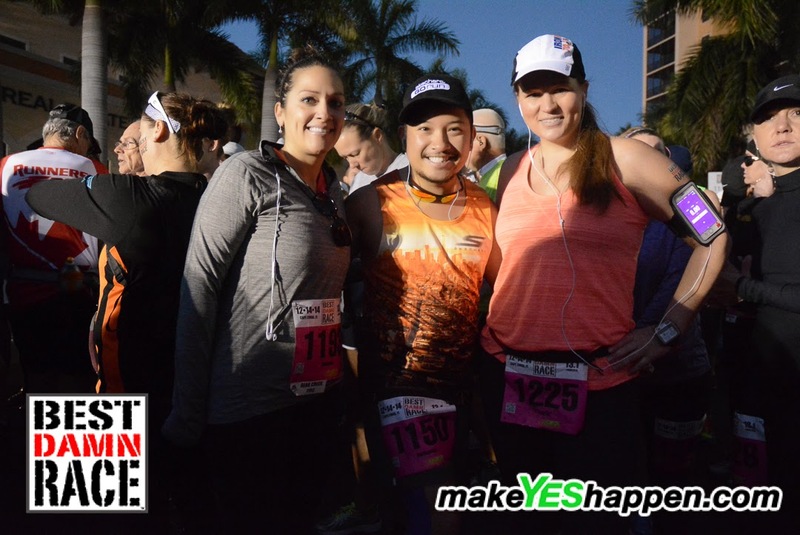 It doesn’t matter if you are an elite runner, first timer, walker, or using a baby jogger, we want you to have the best DAMN race experience." They also have a unique registration process, allowing participants the opportunity to register for as little as $1. 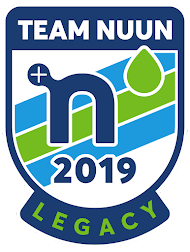 The first 10 participants to register may pay only $1 for the race; participants 11-20 pay only $5; 21-30 only $10; 31-40 only $15l; 41-100 only $20. I met the Founder and CEO of Best Damn Race, Nick Zivolich, at the expo, and he's a great guy, obviously very passionate about the sport of running and pumped to be able to put on these events to show off different parts of Florida from a runner's point of view. Melynda, all three of us running the half! We headed off for a great lunch at Rumrunner's in Cape Harbour, walking distance from the expo, where we had some great seafood (conch fritters, grouper) and some tasty passionfruit margaritas while we sat outside overlooking a canal feeding into the Caloosahatchee River. 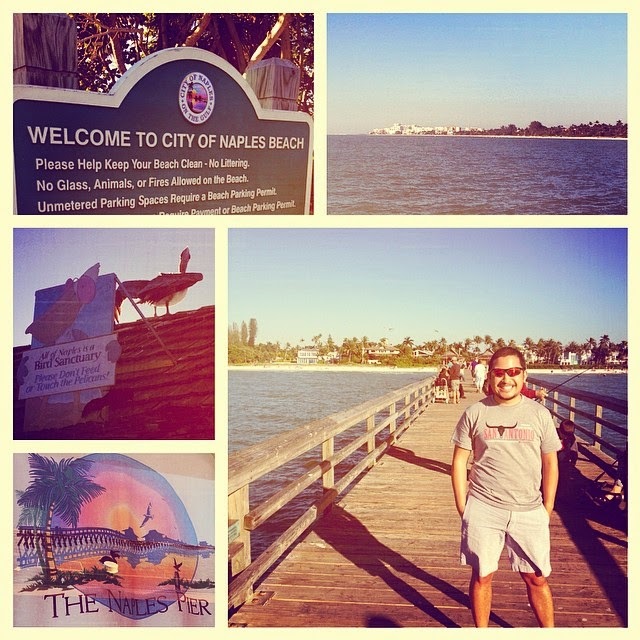 This was our first taste of the city of Cape Coral, which is notable for having more canals than Venice, Italy. Afterward, we headed to our hotel, the Hampton Inn, to check in. Turns out, there aren't many ideally situated hotels near the start, and this was the most feasible/affordable/decent option. Lots of runners from out of town were staying here, too, and we ran into a good amount of them, including Mike and Lori Schwartz, from Palm Harbor, Florida, and their son Chris. 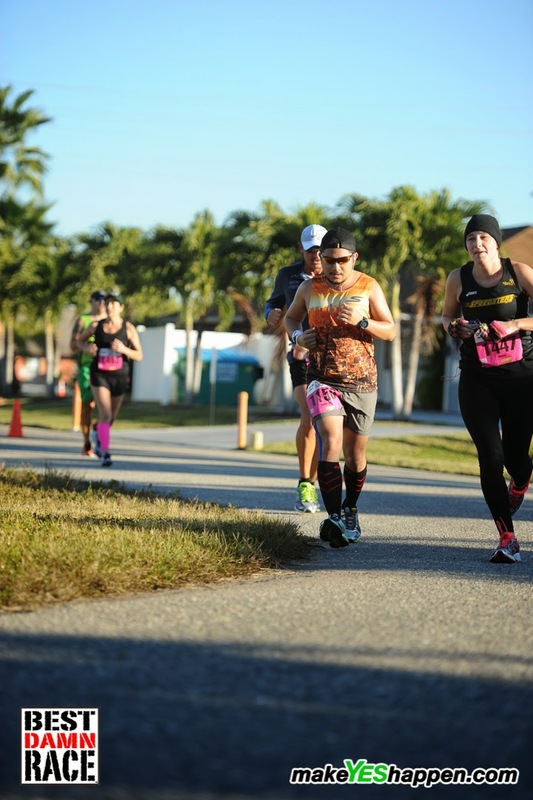 Mike and Lori, who are members of Marathon Maniacs, would be running their 98th and 68th full marathons, respectively, at Cape Coral. 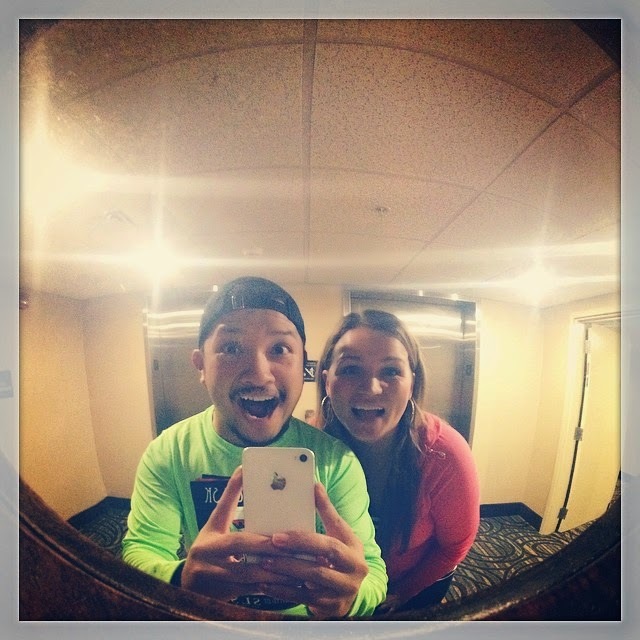 They'll both be in Mississippi and Alabama in January for the big reunion weekend, and Mike will obviously be celebrating finishing his 100th marathon. Lori, who isn't too far behind, also has a respectable resume of full marathons, and in fact told us about having done a full marathon a mere TWO MONTHS after having a heart attack. Such inspirations, these two! Cannot beat the sunsets in Florida! 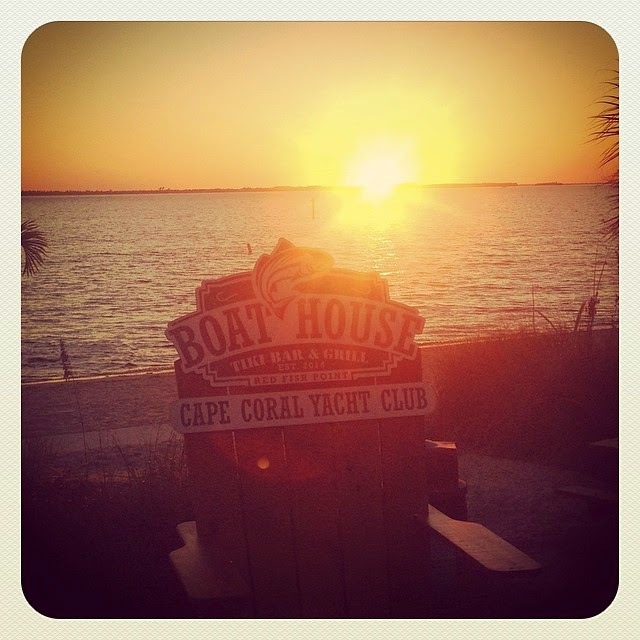 After settling in, Maria and I headed off to a small beach recommended by our hotel concierge, located at the Cape Coral Yacht Club, next to the Boathouse Tiki Bar and Grill. We had the opportunity to sit on the sand for a little bit and then grab RumRunners just as the sun was setting over the horizon. It was magical! We started to get hungry again, so we went back into town and had a delicious Italian meal at Ciao Wood Fired Pizza and Trattoria, a cute homey old-school neighbrohood Italian restaurant, where I ordered a whole 12" sausage, salumi, and sopressata pizza and generously poured glass of Malbec, while Maria, our waiter, and the table next to us watched wide-eyed as I devoured the entire thing. We had an early morning, so shortly thereafter, we headed back to the hotel to turn in. It was about 5am when the alarm clock went off. We were out the door by 5:40 to get ourselves to the start area for parking; the race organizers had warned that streets would be closed off by 6am, and with the start at 6:45, we wanted to be parked close enough to the start at the lots located near the startline. With the temperature in the mid 40s, it was really chilly for the Floridians, and maybe a little chilly for Maria and I, braving the elements in our shorts and sleeveless tees - so we sat in the car for a little bit before we headed to the start at 6:20 to organize for a pre-arranged picture with a few members of Half Fanatics and the Fifty State Half Marathon Club. Mind you, the sun still hadn't come up yet, but by 6:51, we were off! We ran the first mile up Chiquita Boulevard, north toward Cape Coral Parkway, before making a turn onto SW 48th Terrace. Over the second mile, we continued down SW 48th Terrace with a couple detours onto the closest-to-the-sidewalk eastbound lane of Cape Coral Parkway, just to cross over the canal, and then made a turn south onto Skyline Boulevard. Miles 4 and 5 weaved into a quiet neighborhood with single family homes, and then proceeded along Rose Garden Road for the next two miles into Rotary Park, before making a turn around back along the same route to the finish. A simple route, but still very scenic through some of the pretty residential areas of Cape Coral. And great, though small, crowd support from spectators along the course - expected with the size of the race, but still greatly appreciated nonetheless! The first 10k sped by pretty quickly for me! Having come off a 19 mile weekend the week prior, and no running since then, by about mile 5 I started to realize that this could very well be a PR race for me. It helped that it was early enough, the weather was optimal and not too humid, and the course was flat as a pancake. My first three miles were all sub-9 minute miles, and registering as such alongside the physical mile markers along the course. Mile 4 may have been a little off (I think my GPS may have had a little blip here because my watch beep came super early before the marker came along), but it regained the "sync" for mile 5, where I was registering consistent 9:03 to 9:06 mile pace. I even hit an 8:54 at mile 8, and a 9:00 flat at mile 9... but that's when my speed started to get the best of me. My last three four miles were 9:20, 9:20, 9:27, and 9:41 (ack! ), before I gunned it for the last 100 meters to make it in at a 2:00:53 clock time, 2:00:18 chip time. It was a PR nonetheless, but I was still bummed that I was only a mere 18 seconds away from the elusive sub-2 hour half! If only I was just four or five seconds faster in my last four miles, I would've hit it. The disappointment lasted barely a couple minutes while I headed off to the post-race finish festival, and got that majorly-coveted finisher's medal. I quickly got signed up for a massage, which felt AWESOME, and waited for Maria, who only finished about eight minutes behind me. We stuck around to check out the official finishes (which was all gun time - but I got the official chip time upon arriving back in NYC), before making our escape from the area so that Maria could get to the airport for her noon flight. After quickly packing up our bags, showers, and check-out, we headed out to RSW and bid Cape Coral adieu, so I could drop Maria off. Since my flight wasn't until later that night, I spent the rest of the day exploring southwest Florida, getting a much needed Publix sub (a whole Turkey Cranberry Holiday Sub, hello! I mean, when in the south...), ate it on the beach at Delnor-Wiggins Pass State Park just north of Naples, trekked over to Naples Pier to check out the view, and then spend some time at the Miromar Outlets in Estero. I was sad to leave Florida (and this amazing weather) after such a quick trip, but was glad to have marked off State #11, half #13, and get a PR out of it, too! I left work promptly at 4:23 to make my 6:45 flight at LaGuardia airport to head to San Antonio for half #12, state #10, and Rock ‘n’ Roll race #7 of the calendar year! I had to make a connection through Houston (a tight one at that, with only 52 minutes of layover time) so I was skeptical my LGA flight would leave on time and make it to IAH for me to be able to make my connection. Traffic got us off the ground at 7:30, which terrified me, but we made up time in the air and arrived at IAH right on time. Thankfully, the inbound aircraft to take me on the short 40+ minute flight to San Antonio was a little delayed coming in from Minneapolis, so there was a bit of wiggle room. We landed a little after midnight, and my aunt and uncle who live out in Westover Village in west San Antonio picked me up at the airport. 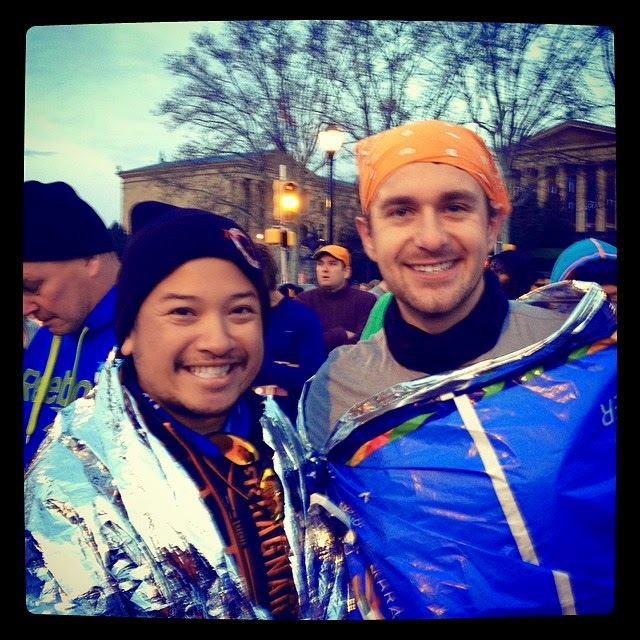 The next morning, we woke up bright and early, for my 9am 10k race. Rock ‘n’ Roll decided to do a 10k for its last remix challenge, so I was up to the task of finishing a cumulative 19.3 miles of running over the course of the weekend. 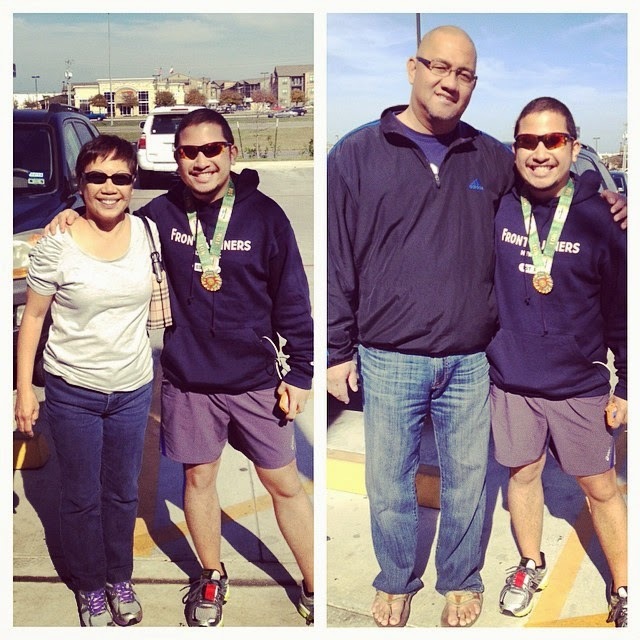 My aunt and uncle dropped me off at the Alamodome with ample time to spare before my race. It was announced awhile ago that Meb Keflezighi, 2009 NYC Marathon winner, 2004 Athens Olympics Silver Medalist in the Marathon, and 2014 Boston Marathon champion, would be present to grand marshal the marathon festivities and also pace a 7:30/mi pace group for the 10k! Not one to miss an opportunity to run with an elite runner, I feebishly joined the 7:30/mi group, knowing full well I wouldn’t be able to keep up. But I did for the first mile! 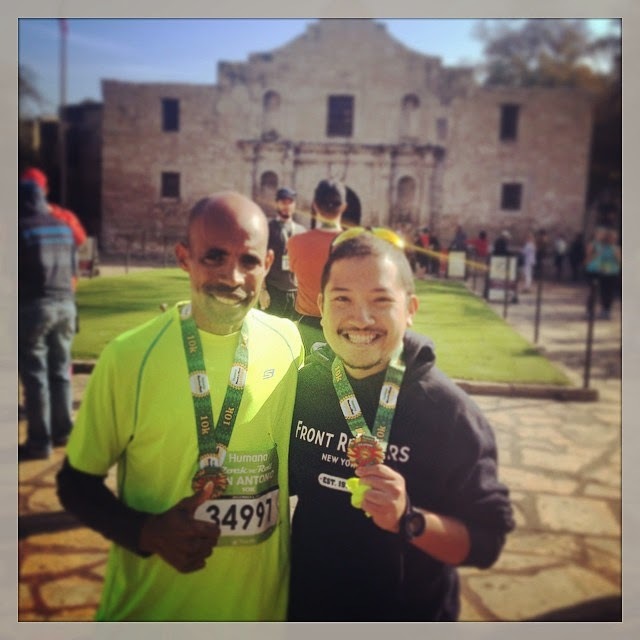 So I can say I ran with Meb! J The race began on Cherry Street adjacent to the Alamodome parking lot where the start and finish festival was being held and then curved in and out of streets in northern San Antonio, ultimately finishing 6.2 miles in Alamo Plaza. There was a brisk wind at the start, but clear skies which turned the temperature up as the day went on, and kept us pretty warm as we approached the finish. 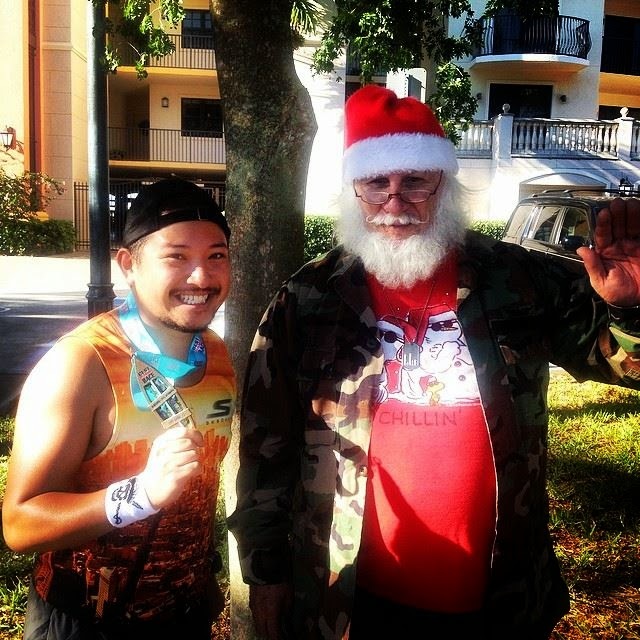 Toward the last mile of the race, I ran into Kelvin, aka Dr. Disco, who I met in Savannah! Always a treat to see a runner as passionate as he is! peppers arranged in a floral pattern! Meb stuck around for a photo op with fans, so I fell in line and waited for my turn. I mentioned to him I was going to wear the Skechers singlet with the NYC skyline that he wore in the 2014 NYC Marathon in Cape Coral next week, which he thought was fun! Shortly thereafter, I grabbed my beer, chugged it down, and then headed to the expo to pick up my bib for the half marathon the next day. The expo was pretty large, utilizing the halls quite well. It seemed that there were other conventions happening at the same time, but the Health and Fitness Expo was sizable and made good use of the hall's space. Practically every booth was taken by exhibitors, most of whom have been at RnR events all year round. The highlight was the Rock 'n' Roll Series main booth, where the new Heavy Medals for the 2015 season were on display. Boy, are they beauties. 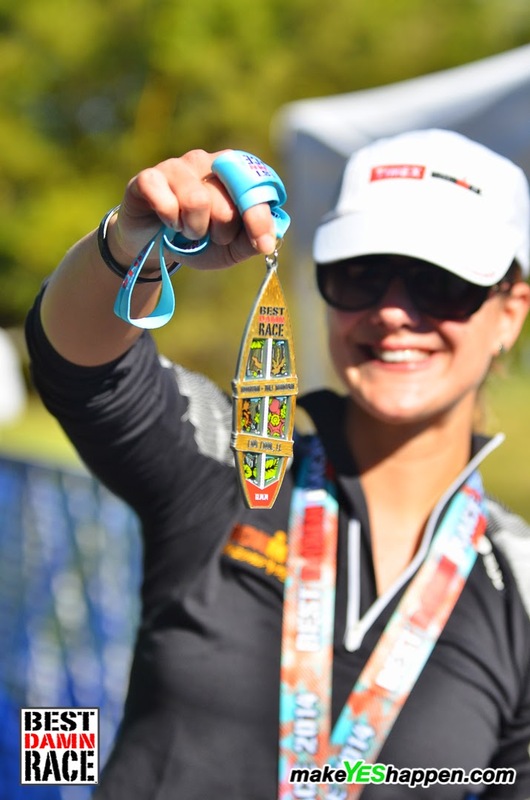 There is a Heavy Medal for every multiple event that runners do for next calendar year, up to ten - and then one for fifteen... and they are MASSIVE, especially once you get to the 8, 9, and 10 event medals. I am super excited to start amassing those as part of my collection next year! 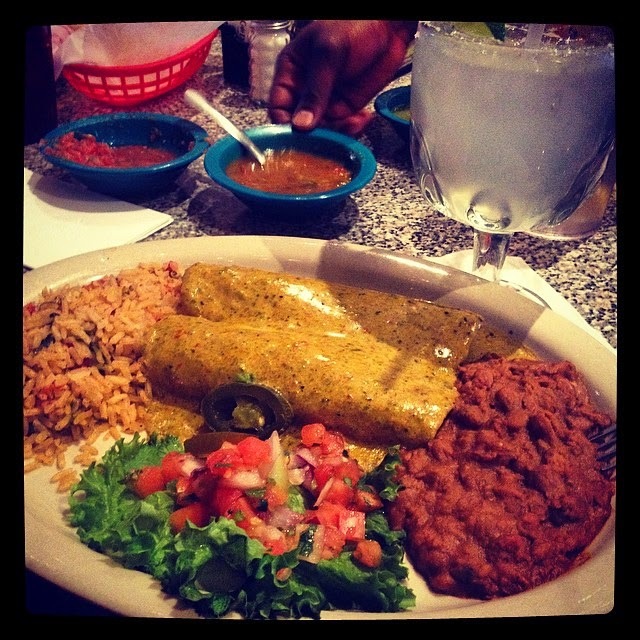 I met up with my aunt and uncle after a little while in the expo and we headed out for lunch with my cousin Dottie and her husband Amadi for some great Tex-Mex at Chuy's. After a shower and little rest, we went back on the road about an hour northwest of San Antonio to the charming town of Fredericksburg, which was settled by German immigrants in the mid 19th century and to this day still retains that character. It has a quaint Main Street with storefronts selling unique gifts and handcrafted items, as well as breweries and wine tasting shoppes. We had dinner at Der Lindenbaum, a cozy historic restaurant serving authentic homemade German food - I had jägerschnitzel with German mashed potatoes and spätzle, and of course a nice sized bottle of Franziskaner Hefeweisse. 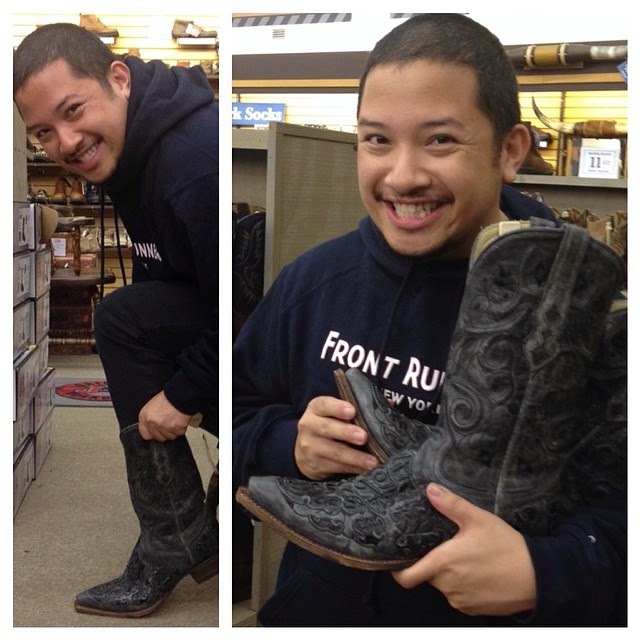 We returned back home early (with a side trip to buy a pair of really awesome cowboy boots!) since the morning would be super early for the start of the race! to go the night before! The following morning, my uncle took me to the race at a little after 6. Traffic started to become a bit of a nightmare near the Alamodome already, and I jumped out of the car to head to gear check, while at the same time being berated by a police officer who told me I wasn't allowed to unload there - oh well, I was in a hurry, it already happened... so I just kept going. 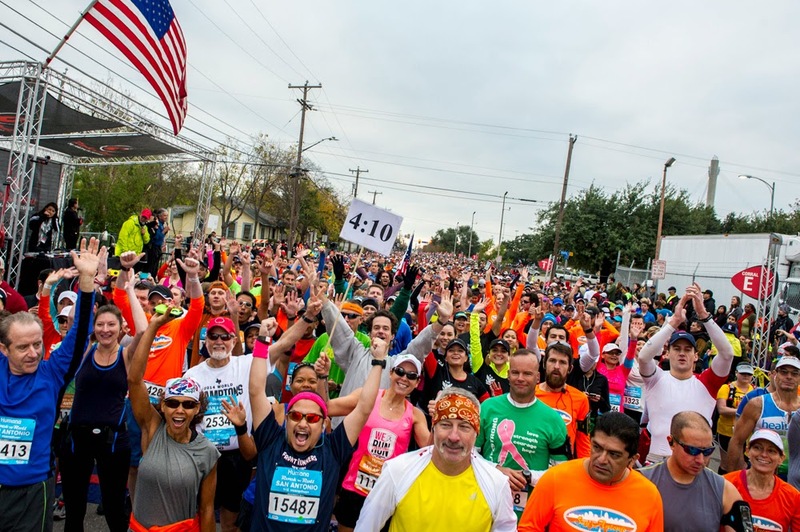 Now, the Alamodome area is massive - and the parking lot, where the start and finish line festival occurred (not to mention, the area where all the port-a-potties were), was cut off by a railroad, and runners had to go through a path underneath the railway, plus a bunch of stairs. A planned photo with the Half Fanatics was to happen at 6:50, but that time came and went, and I had the hardest time trying to locate everyone. I gave up and decided to drop off everything at gear check and rest up a little before the 7:30am start. I headed to corral 11, and waited to go... it was a little after 7:45 when I finally crossed the start line. The weather was decent - cloud cover, but no threat of rain, and maybe around 50 degrees. Pretty awesome weather, actually. 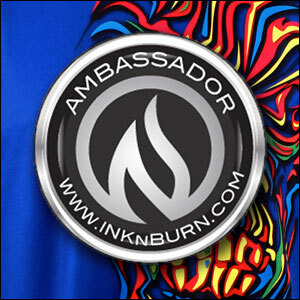 Competitor website! Look, it's me, front and center! The first few miles of the race were a blur - much of it was a repeat of the 10k the day before, however, we ran along Alamo Plaza first before heading north through zig-zaggy roads around the north part of downtown. 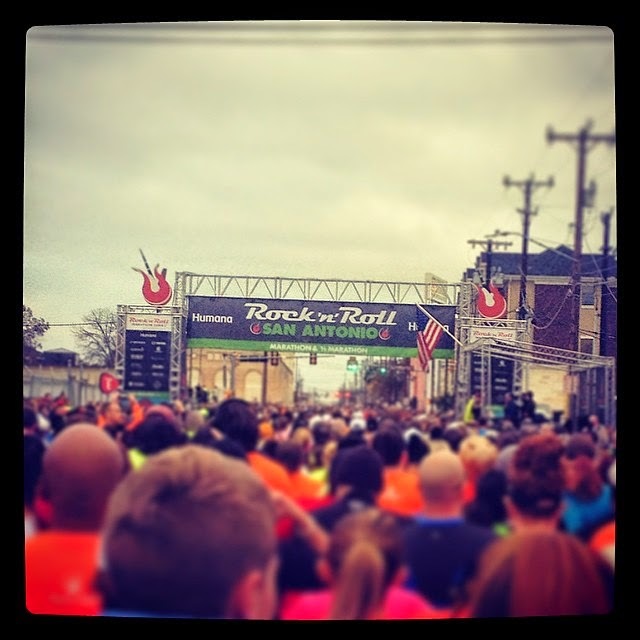 Around mile 4, we started to enter an area that was more residential and headed northeast toward the San Antonio Zoo. At about mile 5, the urge to pee was so great, and there was finally a restroom building that didn't seem to have a line... but I disregarded the actual bathroom and went behind the building to pee. Twenty seconds later, I was back out on the course, feeling a bit more refreshed and recharged... until I realized, we were hitting our first big hill of the race heading up toward Trinity University. My vantage point of the start line! I will now forever associate Trinity with having the most inopportune hills I've encountered in a race. They were truly pretty rough. 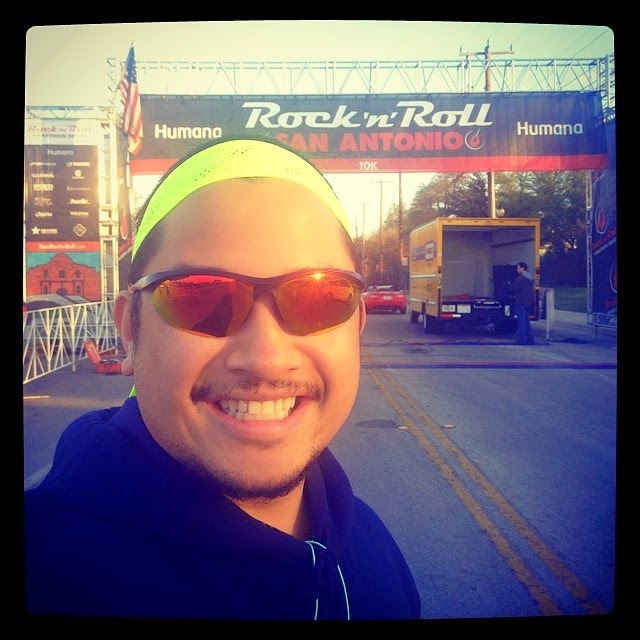 We ran through campus and then through some affluent neighborhoods that were still just as hilly, and finally made it "out of the woods" when we made a left turn onto Main Street for a long stretch, hitting mile 7 through 9 as we reentered the central business district of San Antonio. However, it was through this stretch we encountered some awesome crowds along the course who were cheering us on - so for that, I was very grateful. It even helped me get some faster miles in late into the race! We continued to zig zag on south, passing the Alamodome on the left, in the distance - which was where we were ultimately headed but we still had to go in the opposite direction before turning back around to head to the finish line. A few more turns, and past Brackenridge High School at Mile 11 and a much needed GU stop, we finally made the last stretch, finishing mile 12 and then heading back north along Cherry Street with the finish line in the distance. I was confident of getting a sub 2:15 half; any hopes of getting close to 2:00 were dashed by the hills at Trinity U, so any minutes I could shave off of 2:15 would make me happy. In the end, I crossed the line at 2:10:22, currently my fourth best time of twelve halfs. Not bad, especially after a 10k the day before! 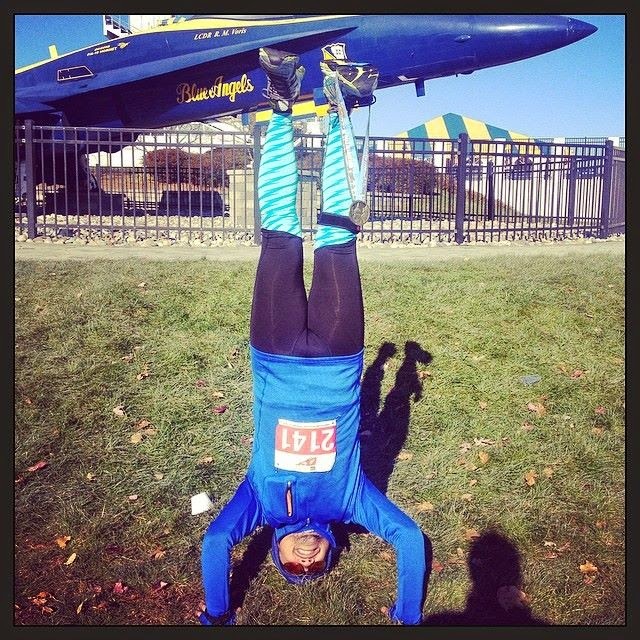 Victory Headstand for Half #12! I quickly retrieved my medal, and headed toward the Heavy Medals tent to get my remix challenge medal and my highly coveted "Rock Legend" medal for finishing seven Rock 'n' Roll events. And then came the reality... gear check was in the Alamodome. This is where I believe Rock 'n' Roll may have dropped the ball. I know the last couple years of the San Antonio race, when it was held in November, were unbearably hot and humid, so the change of using the Alamodome for Gear Check may have been a result of that. However, forcing runners who have just finished 13.1 miles or more to go down and up a flight of stairs in order to traverse a railroad track, then walk all the way around the building to the "entrance," then back down a flight of stairs (mind you, there are escalators in this building that they decided to turn off!) on extremely tired legs was a big mistake. And then the volunteers manning gear check didn't even have scissors to cut off zip ties. I was grumpy. Showing off my coveted "Rock Legend" medal! Super sad to be leaving San Antonio. 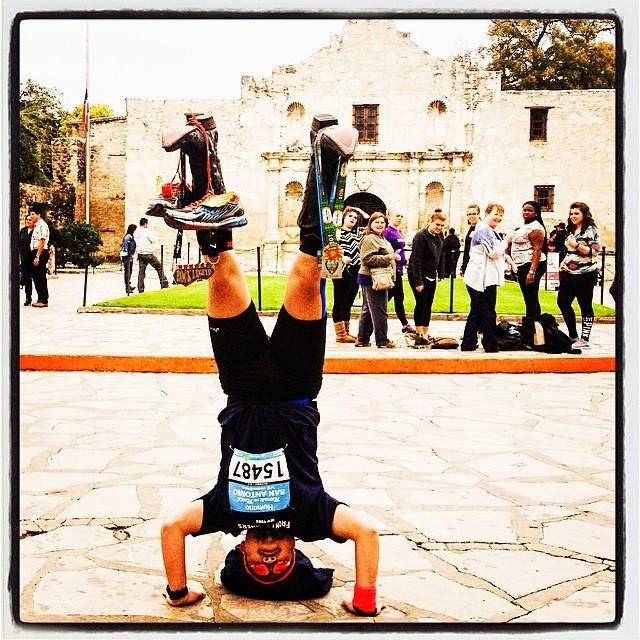 Anyway, I left the Alamodome and headed off to meet my family over near the Alamo for my ritual victory handstand photo, which i wanted with my new cowboy boots and all my medals, with the iconic Alamo in the background. We took the photo then headed off for a quick bite to eat (steak and a massive 20 oz Margarita, yum!) and then they dropped me back off to the airport for my 2pm flight through Houston back to NYC. And with that, my tenth state was marked off my list; half number twelve; and a great experience in San Antonio! 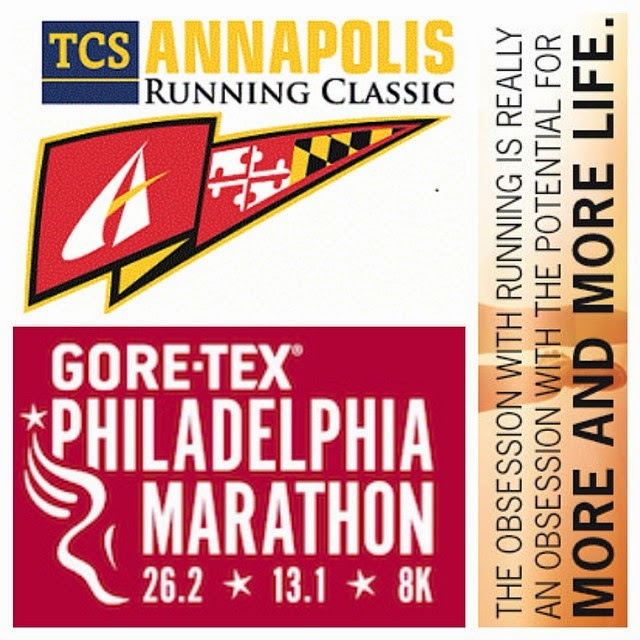 When I last left off, I had finished the Annapolis Running Classic (see race report here) and was driving two hours up to Philadelphia to get to the expo. The early morning and 2+ hours of cold weather running started to get to me halfway through the trip, so I made a rest stop at the Maryland House Travel Plaza along I-95, the newly renovated rest stop just before the bridge over the Susquehanna River near Havre de Grace - one of the prettiest vistas along the I-95 corridor. I filled the car with exactly $14 worth of gas and grabbed a coffee and a quick bite of pumpkin cheesecake to eat before I went back on the road. I arrived in the Philadelphia area around 2pm and proceeded straight for the Convention Center to pick up my bib and wander around the expo. The traffic was pretty atrocious upon entering city-limits and exiting off the freeway - it seemed everyone was trying to get to the expo. I finally gave up and parked in a nearby garage, knowing too well that I was gonna be charged a pretty penny (and I was... $26. Ugh) and made my way to the expo. Upon arriving, I ended up running into some members of my running club, Front Runners New York! Alan, Gen, and Michal were all near the entrance with their bibs so I grabbed a quick picture with them before going in. Shortly thereafter, I met up with my friend Jason, and we went around to check out all of the goings on at the expo. 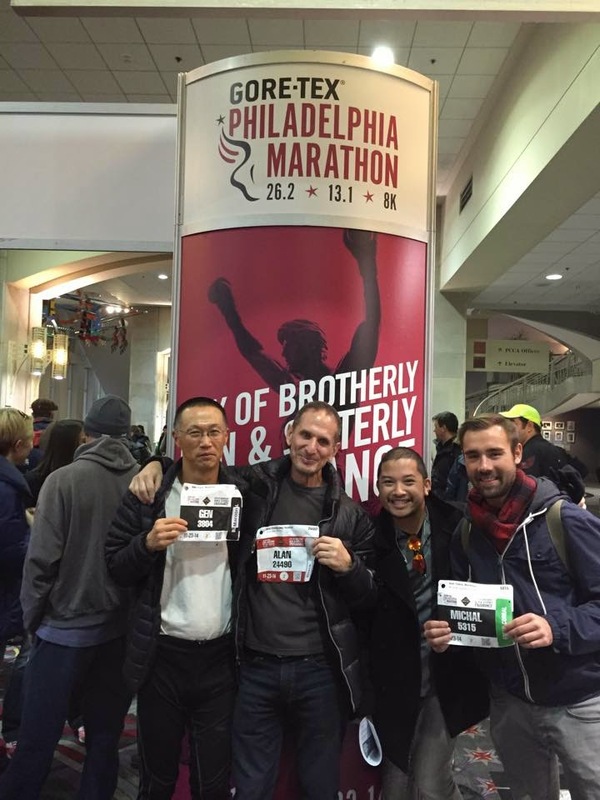 It was decent sized for a "premier" American urban marathon, and I was glad to see a bunch of other booths of races being promoted that would happen along the eastern seaboard - even as far away as Quebec City! Picked up a few handouts from those races to consider for the future. I even was able to head to the booth for The Stick and purchase a replacement for the one that was confiscated from me at JFK the week prior, when I was on my way to Las Vegas; as well as a replacement set of Yurbuds covers, as I had lost mine in the hubbub of the pre-race activities before the half in Vegas. Met up with Jason at the expo too! After the expo, I had some time to kill, so I just decided to head directly toward where the Front Runners dinner was going to be held that night to find parking and just get some rest in the car... as well as refrain from having to pay for parking while I sat in the driver's seat with the hazards on. After a little while, Jason texted me that he was at the restaurant so I threw some quarters in and headed to the restaurant for a glass of vino before dinner. Not long after, members of Front Runners began to trickle in, and we headed upstairs (STAIRS! I had already run one half that morning!) to have dinner. Which took forever. But whatever, despite all that, I had my carb-loading for the evening, and then headed out since I still had a 45 minute drive to my friend (and Ragnar Relay DC captain) Derek's home in Royersford, a suburb northwest of Philly, to rest for the evening. Upon arrival, I met up with Derek's wife Nicole, since Derek had already gone to bed (he was running his first full marathon in the morning! ), and soon thereafter tuckered out myself. We woke up bright and early the next morning since the race started at 7AM, and we still had to drive into Philly, deal with traffic, and find parking. Upon arrival, we found a spot in a slightly rough area in West Philadelphia (at least to Derek), only about a half mile from the start corrals in front of the Philadelphia Museum of Art. The parking spot didn't have any marking on the curb or the street for me to think that I couldn't park there, other than a red sign that said "FDC" on the building right in front of the spot. I later found out that "FDC" meant "Fire Department Connection" and I spent the next three hours worrying that I'd get ticketed, or worse, have my rental towed away. More on that later. So, we got to the start corrals, and the port-a-potty lines were already starting to get pretty long. I separated from Derek and went to the purple corral and met up with Jason, and we waited for the start. 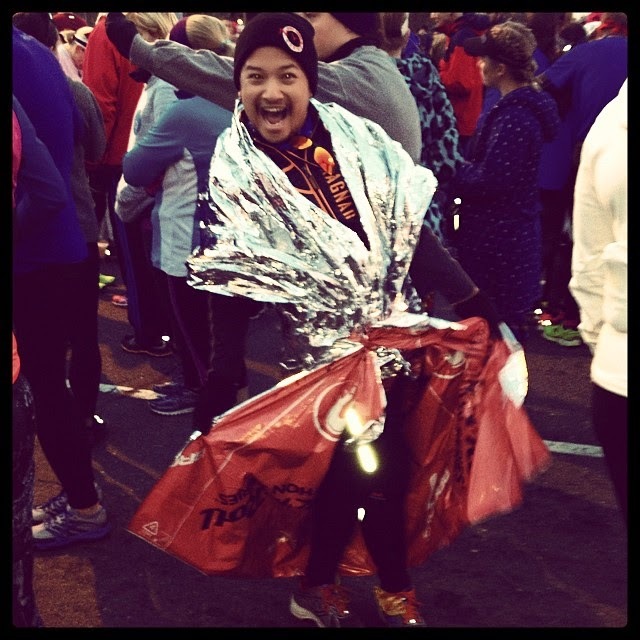 I stayed as warm as possible with two foil blankets. I also kept my Garmin underneath my jacket sleeve, as I didn't want to rely on pacing myself since the ultimate goal was just to get through the race. 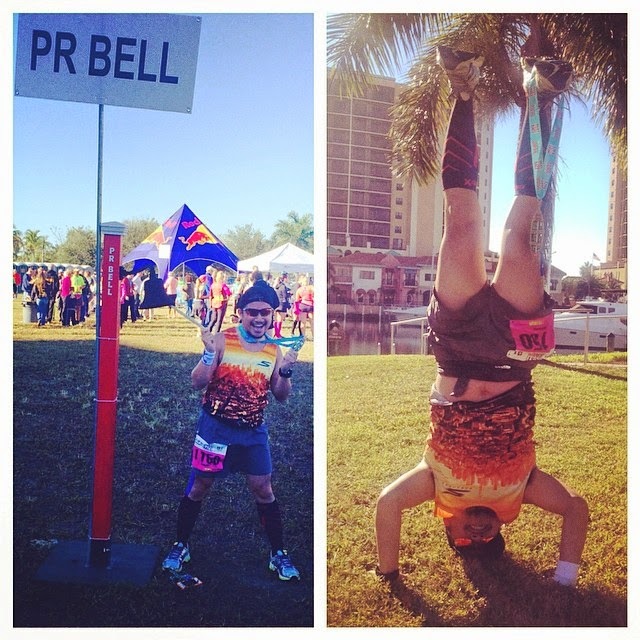 Finally, we began - and I started my second 13.1 of the weekend! Jason and I are aching to start! 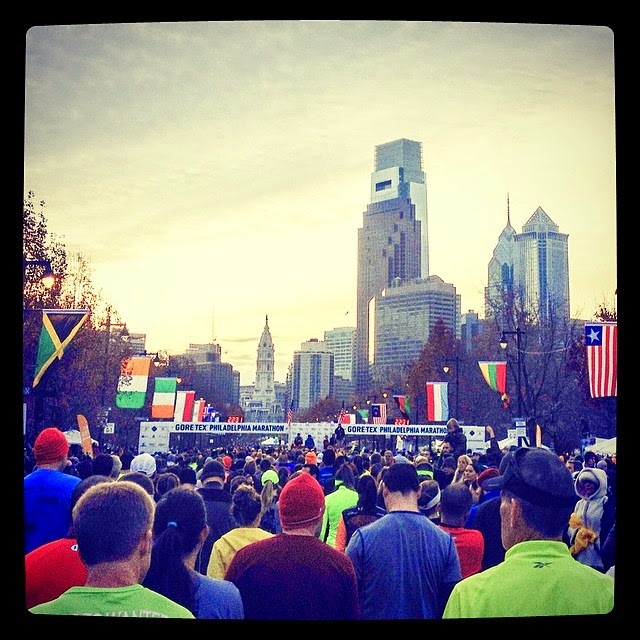 The first mile was down Benjamin Franklin Parkway, the scenic diagonal that runs through the cultural heart of Philly. We ran toward Arch street where we made a gentle left turn onto Arch Street toward the Delaware River. After mile 2, we headed south along Columbus Boulevard next to the river for a mile and a half. The first 5k was a bit of a blur, as I was just adjusting to getting my feet back under me. We made a couple right turns and headed back up north; at mile 5, we ran alongside Independence Hall and the Liberty Bell. 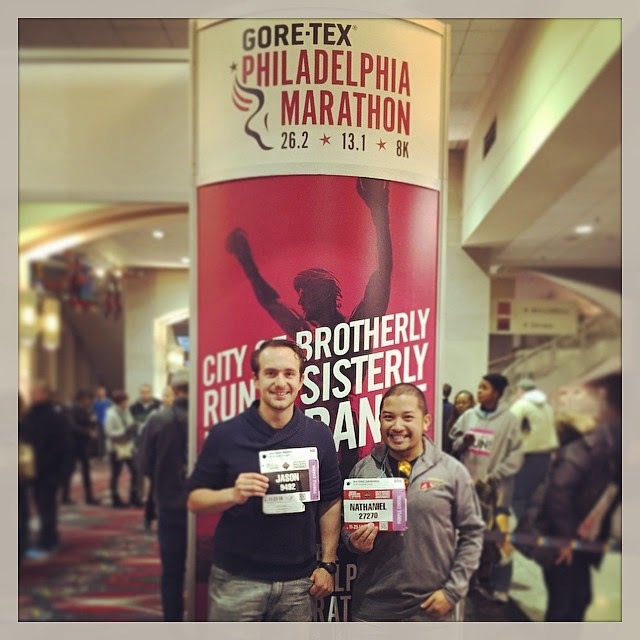 We made a left turn onto Chestnut Street, and then we ran down my favorite stretch of the race - two miles of downtown Philly, with crowd support on both sides of the street cheering us along. I kept one earphone in my ear while I sang along to RuPaul's "Sissy That Walk" on repeat, and fed on the crowd's energy! Just before mile 7, we crossed a bridge over the Schuylkill River into University City, where we began to encounter our first hills of the race. This is also where the cumulative mileage started to take it's toll on me - consider it mile 20, so it's not much of a surprise. 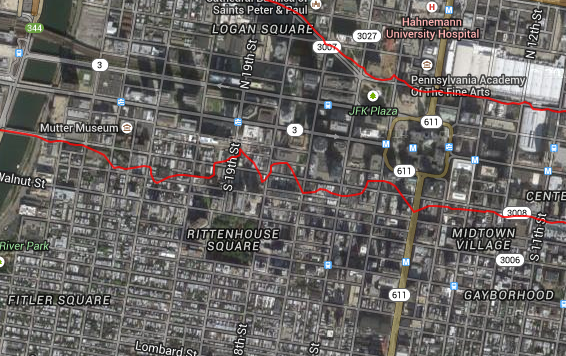 We passed through Drexel's campus along 34th Street along another rough hill and then across an overpass near the Philly Zoo. Another hill hit at the 9 mile mark entering West Fairmount Park, and around this area was a winding path where there was a group of ladies who were cheering for the runners, and had their own personal coffee and donut area set up as they cheered. Technically, it was for them, but I eyed their food longingly and politely asked for a donut, which they obliged. I proceeded to run, with donut for the next few minutes... and it was such a needed donut - that pink frosting, that soft sugary deliciousness... 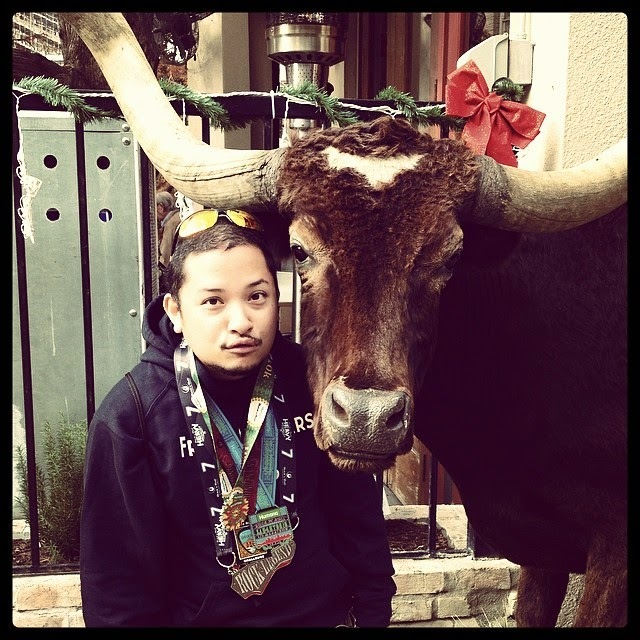 Runners running near me couldn't help but laugh, while I exclaimed, "Hey! I run so I can eat. Don't you?!" We rounded the corner at Mile 10 past the Please Touch Museum and finally got some Clif Shot gel as we made our way to the turn around point before hugging the shoreline of the Schuylkill River as we made our way back toward the Art Museum. The last two miles were some of the roughest, mostly because we could SEE THE ART MUSEUM and know it was the finish line right there... well, at least for us Half Marathoners. Victory Handstand for Half #11 / State #9! See, the cruel part is that as we made our way on the bridge across the Schuylkill before hitting Mile 13 in front of the Art Museum, the half marathoners are directed to the right toward the finish line (essentially, our start line), while the full marathoners are directed toward the left to begin the second half of the race toward Boathouse Row, East Fairmount Park, and the rolling hills of Manayunk before heading all the way back to the same finish line. 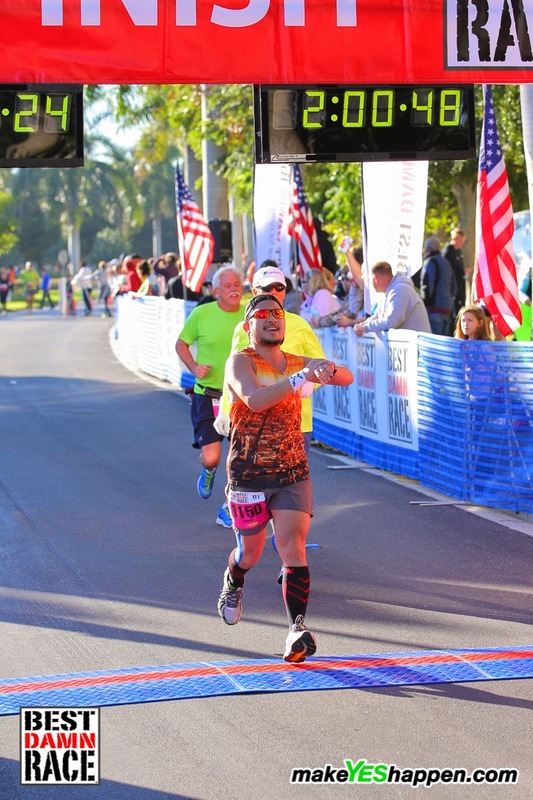 I made my way to the finish, happy that I actually finished in 2:23:29 and only about 9 1/2 minutes slower than the previous day's half. After getting my medal, heat sheet, some snacks in my system, and through the finisher's chute, I made my way back toward my parking spot, hoping and praying that it survived the last 3+ hours and didn't get ticketed or towed. And thank the heavens, it was not. Seems the police were busy having to manage a race or something. I reparked the car in another spot (actually in the pay lot we were initially going to go that morning, however there was no attendant when I arrived so I didn't pay! ), and then headed back toward the finish line to meet up with Nicole who was patiently waiting with her one year old daughter Madison for Derek! 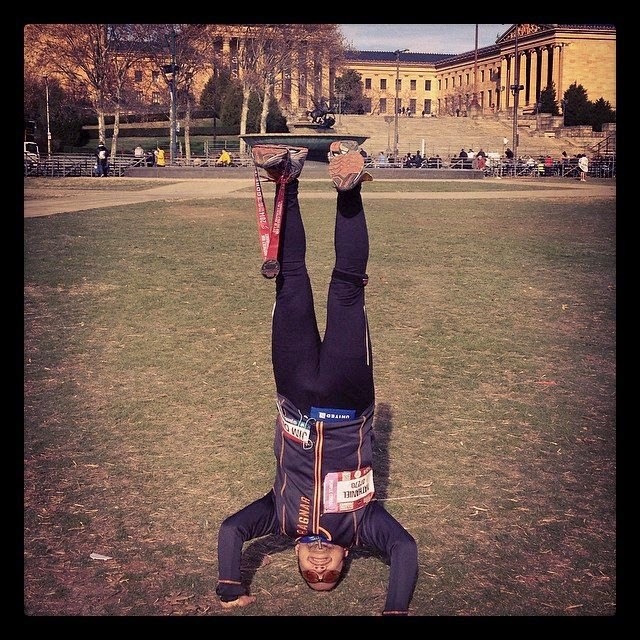 the Philly Half and Full! 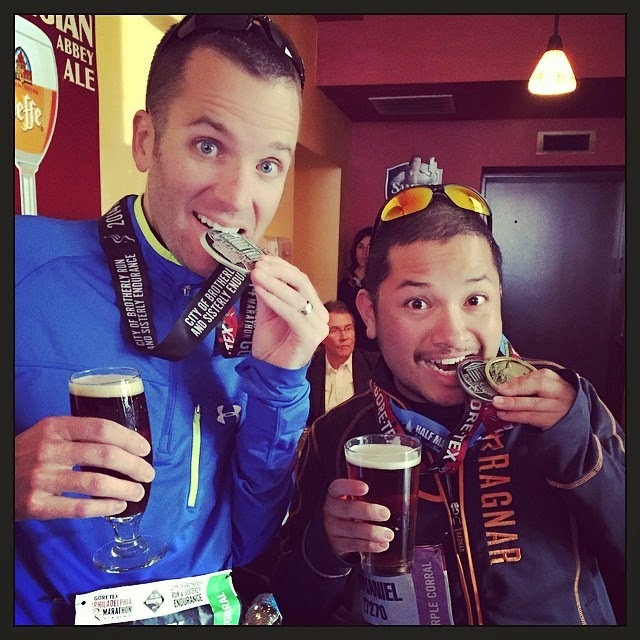 Derek finished his first marathon, and we proceeded to head to a much-needed lunch at Rembrandt's Restaurant & Bar in the Fairmount neighborhood, located near the Eastern State Penitentiary. After a beer and a delicious burger, I was all set and ready to get back into my car and head back to Newark Airport to drop it back off at the rental. The drive back was the most difficult 90 minute drive I've ever done, having to fight my drowsiness from 48 hours of go-go-go. At the same time, I figured I had just enough gas to get me back to the airport, and I was told to bring it back as close to empty as possible. Little did they know I would take that literally and do just that - my odometer/gas gauge had an indicator of "miles before empty," and when it had 30 miles left, it stopped registering and began to blink at me... for the next thirty minutes. I figured by the time I got back to Enterprise there was maybe five miles of gas left in the car. I arrived, groggily got all of my stuff and trudged slowly to the AirTrain, NJTransit, and to the subway, where I was greeted with crazy delays, before heading home, exhausted beyond belief. And I was so exhausted... that I called into work the next day sore. I couldn't move. I felt more tired than after Chicago! I took the day off to recover, and went back to work the next day, grateful that I didn't have another run for two more weeks. And with that, I completed my 11th half and 9th state in my quest to finish a half in every U.S. state! I knew going into it that this weekend was not going to be easy. 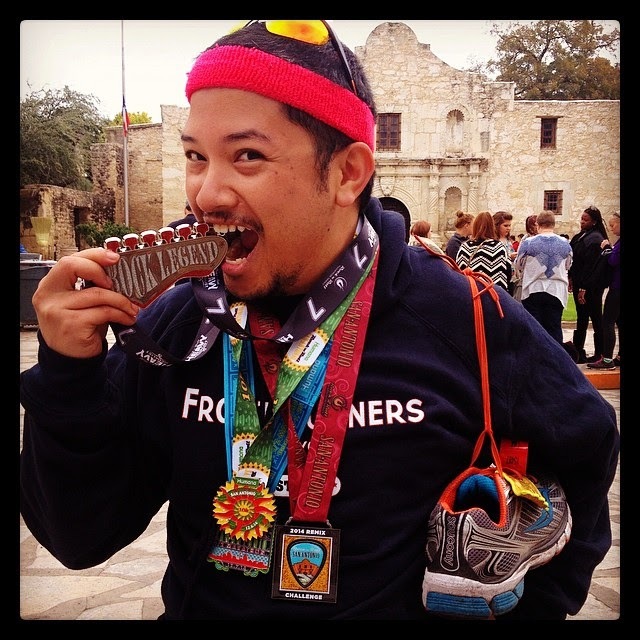 Scheduling two half marathons back-to-back is bordering on insanity. And the fact that the two races would be my third and fourth half in the month of November – it definitely would be a real test. I would reach my milestone tenth lifetime half marathon (and tenth of the year) at the Annapolis Running Classic in Annapolis, Maryland on Saturday. It would also be my eighth state to cross off my list of fifty states to run a half marathon in. On Friday night, November 21, I left work to head to Newark Airport and pick up a rental car for the weekend. Originally, I was going to pick up a car from Hoboken but in the week before my trip, I lucked upon a $17 a day rental instead of $45 per day. By 7pm, I was en route to Annapolis, Maryland in a pretty blue Nissan Sentra. 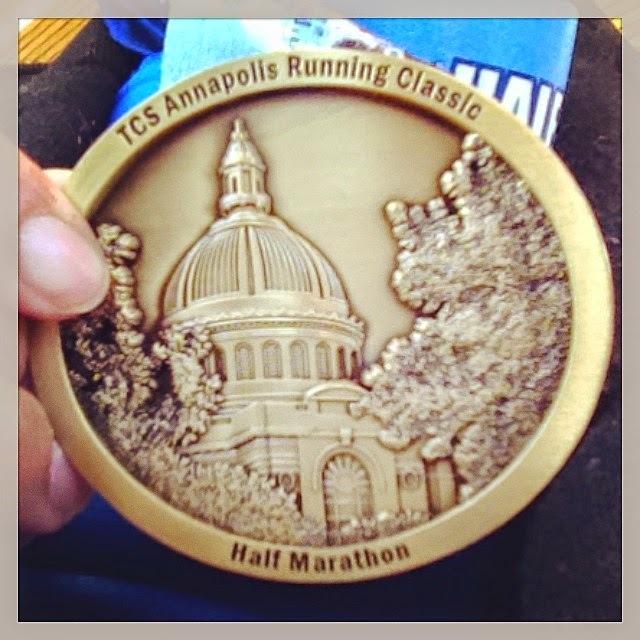 of the Annapolis Running Classic! After a three and a half hour drive, I arrived at my homestay for the evening in South Annapolis. Thank you Heather and Will Montague for the quick six hour stay! I laid my kit out for the morning and went promptly to bed, as the drive had definitely tired me out. I woke up at 5:00am and got myself ready and out the door by 5:45. The car had a thin film of frost on the windshield, so I had to turn the front and rear defrosters on. It was definitely cold. I got to the Navy-Marine Corps Memorial Stadium at 6am, with more than enough time to warm up and pick up my bib prior to the start of the race at 7. The temperature at the start was 25 degrees. The field wasn’t too crowded, so we went off without a hitch from the parking lot of Navy-Marine Corps Memorial Stadium and circled around the route passing single-family homes on both sides. We would also be crossing a series of bridges that crossed tributaries of Chesapeake Bay. The course had several turn around spots where we would be seeing other runners. 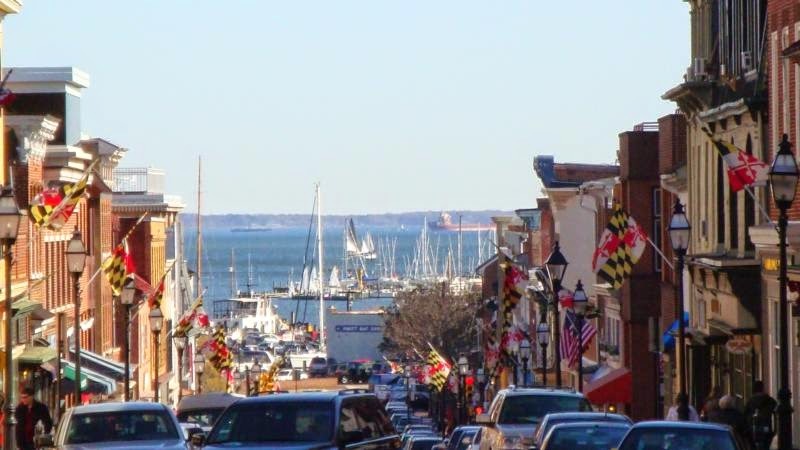 One of my favorite spots was about 2.5 miles in, when we turned onto Main Street – a nice downhill with quaint little mom and pop storefronts on both sides of the street and a gorgeous view of Chesapeake Bay and the Annapolis Harbor in front of you. 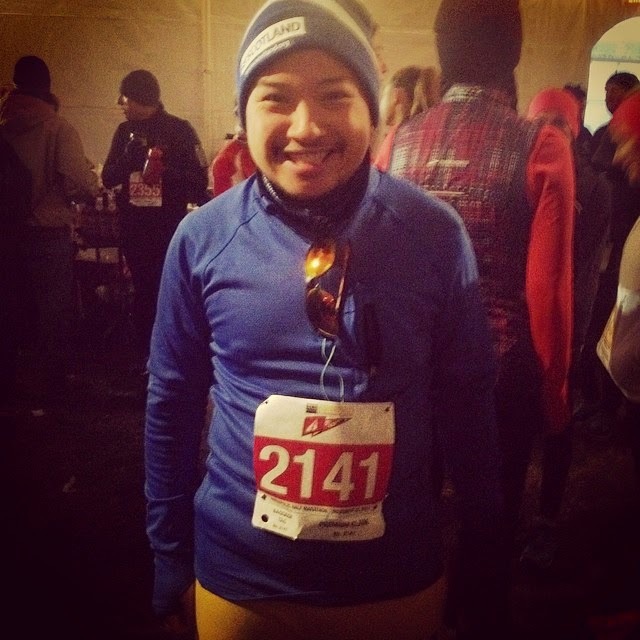 At the end of the harbor was a turnaround spot with a water stop… which was a bit perilous – below freezing weather and spilled water made for a very slippery running surface. And when the ground was made up of bricks… even worse. Needless to say, I walked at this point. It happened to be the 5k point, and I had decided before the race that I would be enforcing three minutes of walking upon reaching each 5k point, just to pace myself and not overdo it since I had another half the following day. I had to run over... twice. Around the 3.5-4.5 mile mark was where we encountered a little bit of a problem. It seems that some of the runners out front made a left turn onto a street that would be used as an “out and back point” into the right lane of the street rather than the left lane. This caused a bit of a traffic jam for runners returning in the other lane where there was a bit of a criss-cross. By the time we had returned to that point, the race coordinators had resolved the issue and had the remaining runners hug the curb to run on the left side of the street. We proceeded toward the Naval Academy Bridge along King George Street, which was just after the 5-mile mark of the race. Seeing it was jarring… you could easily see the crest of the bridge, and you knew you’d be in for a tough climb to get over that elevation. Nevertheless, I trudged along. At about the midpoint of the bridge, we could see the leaders of the race approaching, heading back toward the stadium for their finish. We continued on, partly along the highway and onto more hilly areas of the race on the other side of the Severn River where there was another out-and-back. Luckily around the turnaround point was the 8 mile of the race, and I took another three minute walk break. Slippery here as well! I continued along and cheered on the other runners who were making their way through the hills. completed! And it was a cold one! 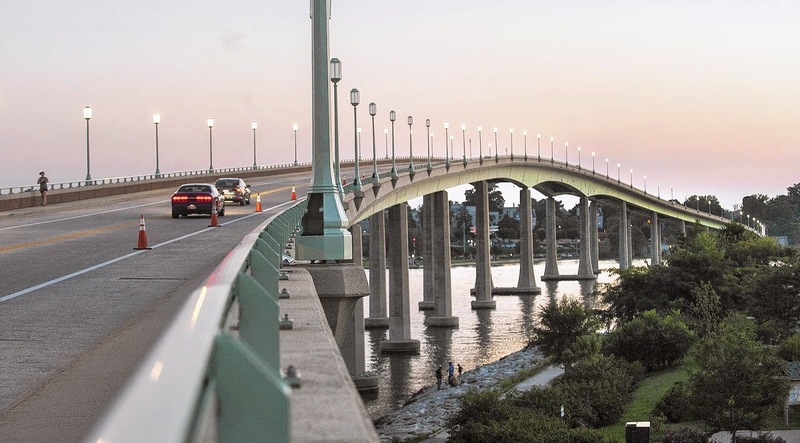 We returned across the Naval Academy Bridge for the second time, and then made a turn back toward downtown Annapolis on King George Street, which had another turn around at College Avenue to return back down King George Street for one last time. 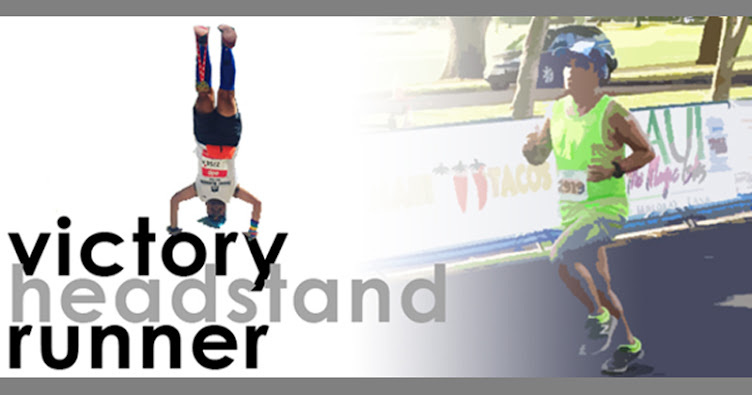 We were in the final stretch and finally made it to mile 12, and then turned left to run the last mile back into the Navy-Marine Corps Memorial Stadium parking lot and to the finish line, where a heat sheet and our finisher's medal awaited us. 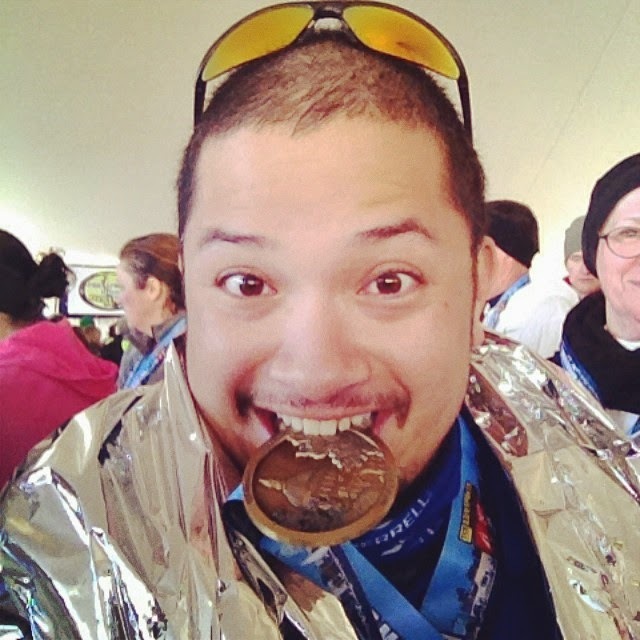 I finished in 2:14:02, and the weather had warmed up... to 34 degrees. to beat. Free oysters? Yes, please! We were directed to head to the smaller "Runner's Village" that was set up for us to pick up our finishers' premium - a quarter-zip Dri-Fit jersey - and post-race bananas, bagels, and homemade country tomato soup! 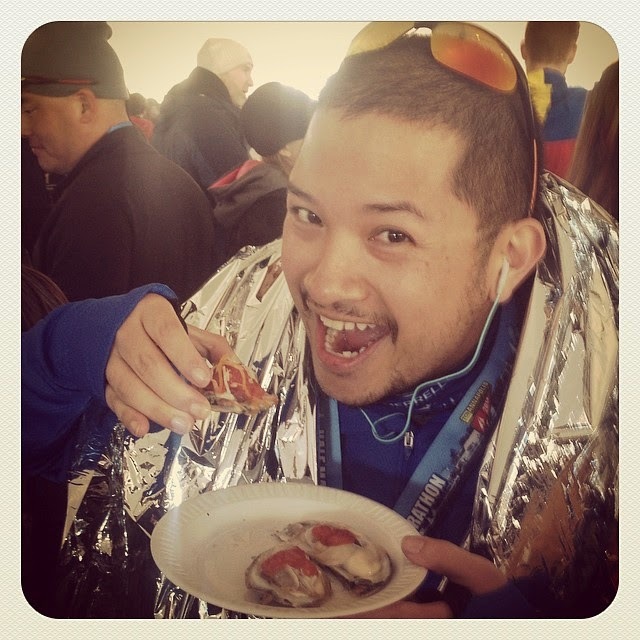 But that wasn't all... we were given an after party that had a live cover band, several beers (and root beer and hard cider) on tap, and... OYSTERS, both grilled and on the half shell, free for all finishers. I stuck around as long as I could to partake in this after-party, of course got my headstand photo taken in front of the Blue Angels plane on display outside of the stadium, before getting back on the road again for the two hour drive up to Philadelphia to pick up my bib for my second half of the weekend.